Vland is a high-population world with a billion or more sophonts in population size. It is a member of the Third Imperium in the Vland Subsector of Vland Sector in the Domain of Vland. This is the homeworld of the Vilani branch of Humaniti, a Major Race. This mainworld has been a major trade and cultural center for the core/spinward regions of the Imperium for centuries. It was an interstellar trade focus for millennia before the Third Imperium. It is located on the Vilani Main. Vland is notable as the homeworld of the Vilani and former capital of the Vilani Imperium. Its F8 V homestar is known as Urakkalan. The sky from Vland has two notable stars, Deneb at magnitude -4.7 (visible during daylight hours) and Antares at magnitude -1.6. This world is orbited by three self-sufficient geostationary space habitats that serve as both highports and industrial manufacturing centers. All inbound interstellar traffic must be cleared at one of the highports before it is allowed to proceed to a downport. This world is also orbited by three natural satellites: innermost Irukka, well-colonized Gashema, and large, distant Kalaguur. The combined illumination provided by these three moons make dark nights virtually unknown. When all three moons are full, the nigh time light level makes outdoor reading possible without artificial aid. Irukka ia barren ball of rock orbiting roughly 170,000 km from Vland. A small corporate mining and fueling station is maintained here, along with a government-operated weather surveillance post. The latter installation coordinates information from thousands of weather satellites circling Vland in geostationary orbits. Gashema is marginally habitable with its thin atmosphere and significant amount of free water. Orbiting Vland at a distance 550,000 km, Gashema supports a thriving colony, a psychohistorical research station, and a military base - The operational headquarters of Vland's COACC. Kalaquur is a large satellite, nearly large enough to be a twin planet. A distant 720,000 km from Vland, Kalaquur is seldom visited. Its atmosphere - rich with sulfur compounds - is poisonous, and the only local settlement is a small corporate mining colony. This world has an axial tilt of 6.32o. This world has a diameter of 14,850 km and a mass of 1.45 M⊕. This world has an average density of 1.02 D⊕, producing a surface gravity of 1.15g and a surface atmospheric pressure of 1.00 atm. This world has a rotational period of 31h 48m 18s and an orbital period of 478.72 standard days. A Vlandian Local Day is called a "Drandir" (lit. "Day-Night") and is about 31.8 hours long. A Vlandian Year is called a "Gurkula" and is 360 drandir in length. This world is also orbited by three natural satellites. The combined illumination provided by these three moons make dark nights virtually unknown. When all three moons are full, the nigh time light level makes outdoor reading possible without artificial aid. This world is a warm world whose equatorial temperatures often reach 40oC or higher, and whose poles rarely drop below -35oC. As a result, most cities are located along coastal stretches in order to take advantage of the cooler ocean breezes. Vland has a pressure of 0.71 to 1.49 atmospheres. This world has two large continents and five smaller ones, in addition to many large islands and archipelagoes. Khii Eshkhima (Vil. "Land of the Gods' Wars") is the largest continent on Vland, and lies mostly in Vland's southern hemisphere. A 2300km stretch of the northwestern coastline is dominated by a chain of rugged mountains and sea cliffs known as the Nedapip Wall. Southeast of this barrier lies the Siigiizuni River (Vil. "River of Heroes"), which runs through Kuragan's Jungle. The western part of the continent is dominated by The Edamar, or inland "Sea of Fables", near which at an oasis by the source of the Siigiizuni River is the Heroes of Vland Planetary Monument, which was constructed along its banks. Over half of the continent's interior is dominated by the steppeland known as the Dikaai desert, most of which in the modern era has been terraformed as an agricultural production region. It was on the Khii Eshkhima continent thousands of years ago that the Ancient automatons engaged in most of their fighting during the Final War. The largest northern continent is named Lugikad, and is heavily urbanized and the site of Vland's two largest cities (the planetary capital of Enlugal, and Ishimaga, the location of the renowned Encyclopedia), as well as two downports. The continent is dominated by the Ashkige mountain range which divides the eastern half of the continent from the west. The Degar (Vil. "Grey") River has its source on the Ashkige, flowing into the sea at the site of the city of Ishimaga. Enlugal is the site of the Imperial Palace of the old Ziru Sirka, now maintained as a museum of the Old Vilani Imperium. Next to the Imperial Palace and housing one of the largest assemblages of information collected in one place is the Imperial Library, the oldest library in continuous operation in all of explored space. It is primarily concerned with the history of Vland, its culture, and the Ziru Sirka. An isolated mountain near the Ashkige range named the Founder's Peak has a kilometer-high bas relief of the First Triumvirate who founded the original Ziru Sirka. The tallest figure of the carving holds five stars in his left hand while two other figures flank him holding up his arms with their own outstretched hands. Lugikad is the original home of the Vilani race. The circumpolar southern continent of Vland is named Shudushkir. Shudushkir is the only landmass on Vland that receives any significant snowfall. Habitation is found primarily on a peninsula that extends into more northerly latitudes. The continent of Alashad is the farthest northern-reaching continent. The northern parts of the continent are barren, cool desert-land, while the southern parts have a large number of parks and residential areas dedicated to vacationers. The continent of Ushirud Kiigi straddles Vland's equator. Ushirud Kiigi's single large city, Arugis, is surrounded by privately-owned middle-class residences. Admegun Lasha (Vil. "Land of the Sky") is a wilderness continent dominated by mountains, hilly forested uplands, and rugged coasts. It is a favorite destination for vacationers and off-worlders seeking outdoor recreational activities. The Admegun Rangers and Admegun Flotilla of the Vilani Wet Navy patrol the interior and coastal region. Irka Ir is half desert and is Vland's smallest continent. Lying far south of Vland's equator, it sports a much more temperate climate than much of the rest of the planet. The continent has two major urban centers surrounded by a sizeable region of semi-urban dwellings. The Vilani people, a major race of Humaniti originated here and Vland is their homeworld. It is widely believed that one of the battles of the Ancients Final War was fought on this planet. Treasure seekers often search for artifacts left over from those battles, any of which might contain incredible technologies and untold riches. 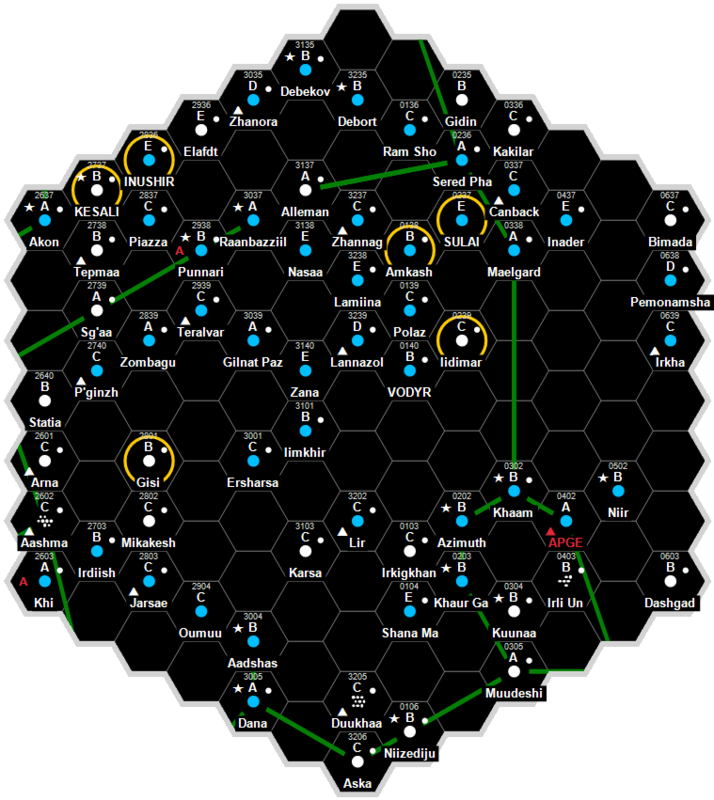 Vland is a high-population Imperial world and sector capital, in Vland Subsector of Vland Sector. Vland, as a member world of the Third Imperium, holds the estate of four members of the Imperial Nobility, who are charged with overseeing the world. It holds the fiefdom of an Imperial archduke. Vland has an excellent quality starport. Vland has an Impersonal Bureaucracy government. Vland possesses a Technology Level of TL–15 or TL-F in Hexadecimal Notation. Vland is the corporate headquarters for the megacorporation Zirunkariish. Vland is the corporate headquarters for the shipping lines of Khugishu Bilanidin, but most of the lines activities runs through Gashema. Vland is the capital of the so-called Restored Vilani Empire. Marc Miller. "Library Data." Secret of the Ancients (1984): TBD. Gary L. Thomas. The Travellers' Digest 05 (Digest Group Publications, 1986), TBD. Marc Miller. "Library Data." Imperial Encyclopedia (1987): TBD. Gary L. Thomas. "Hand Computers." The Travellers' Digest 08 (1987): TBD. James Holden, Joe D. Fugate Sr., Terrance McInnes. "Vland: The Vilani Homeworld, Vilani Referee's Section." Vilani & Vargr (1990): TBD. Loren Wiseman. "Traveller News Service." Challenge 43 (1990): TBD. Dave Nilsen. "Traveller News Service." Survival Margin (1993): TBD. Marc Miller. Agent of the Imperium (Far Future Enterprises, 2015), 175. This page was last modified on 31 March 2019, at 22:27.